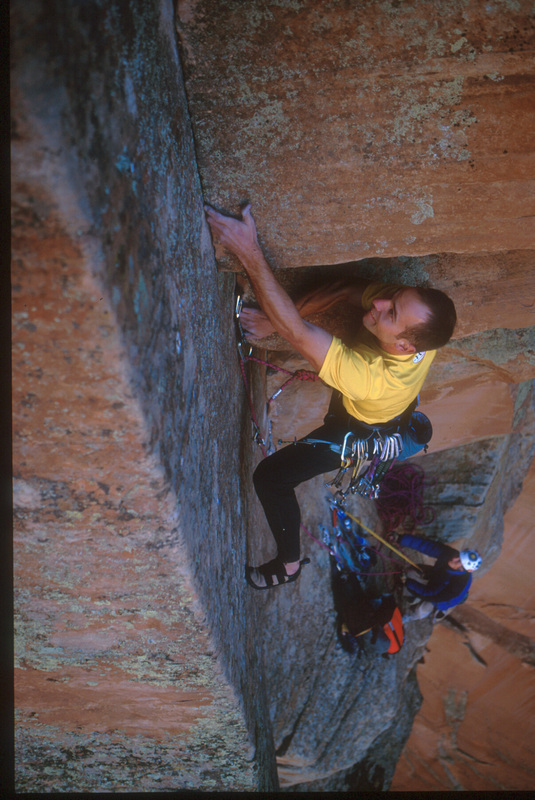 The First Free Ascent of the Lowe Route, in Zion, UT back in 2004 (5.13-). Around the mid-2000’s, I was quite the “desert rat”. I fell in love with the big sandstone walls of Zion National Park, and did a lot of pioneering climbing there; either first free ascents of former aid climbs, or first ascents. Last fall I recounted the first free ascent of the Lowe Route in a “flashback post”. With six years on the east coast and a couple young boys in the house, I didn’t have much opportunity for multi-pitch climbing, or even trad or crack climbing. Now that I’m back west, the itch was beginning to build, and I made it a priority to get back into the grooves of crack climbing. Our “spring break” was approaching, so we hatched plans…. After years of focusing on improving my climbing ability and sport climbing, I am stronger than ever, but I knew I needed to brush up on my crack climbing technique, especially because my goal was to climb sandstone routes. Granite crack climbing has a lot more in common with sport climbing because the cracks (especially as they get harder), tend to be similar to face climbs, with small hand and footholds. 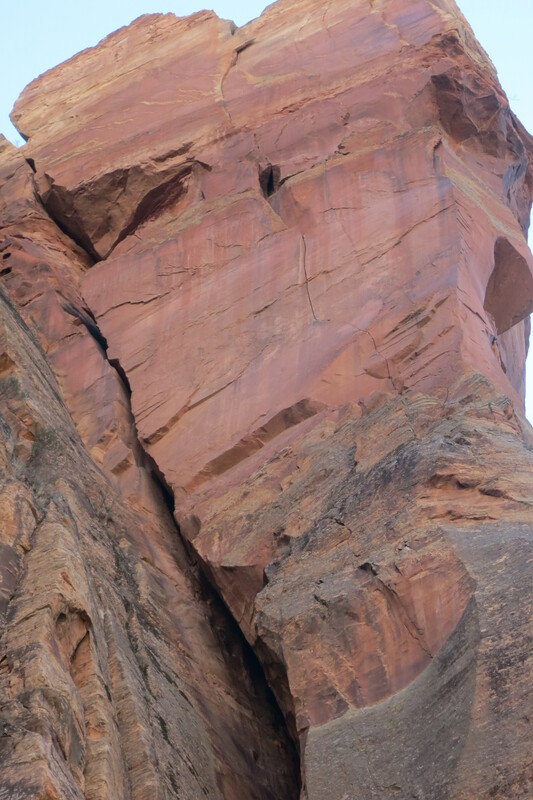 Sandstone cracks, however, are often devoid of such face features, and instead, require pure crack techniques, such as finger and toe jamming to ascend. If you’re not familiar with it, it requires highly specialized techniques, and practice to master. I had mastered it at one time, but it had been awhile. So, I decided some “tune-up” climbing was needed, and on the first day of our week-long trip, we set out for Escalante Canyon in Western Colorado, just outside Grand Junction (this was nice because it also afforded an opportunity to take the family mountain biking on the world-class trails of Fruita, CO). Fred and Barney’s Crack – a nice warmup with a variety of sizes. From Mountain Project. I got some recommendations from my long-time trad partner Rob Pizem (who lives in Grand Junction), and Lamont Smith on the best places to go, and we settled on the “Cabin Wall” for some fundamental crack practice. This turned out to be the perfect choice. We were able to chase shade throughout the morning, and for my first day back on the sandstone cracks in seven years, I got in six pitches that spanned all the possible crack sizes. Compared to better-known desert crack crags (like Indian Creek), the climbs in Escalante tend to be shorter, and more varied. I like this a lot for the type of practice I needed. It allowed me to focus on the particular sizes of crack that I needed to work, and also practice the oh-so-critical transitions between difficult sizes. Because the crag is south facing, we had to race against the sun, so we didn’t pause to take pictures. Instead, I’ve posted some from Mountain Project of the routes I climbed to give you a feel. Redneck Justuss – A great 1″ splitter crack that requires some ring-locking ~ usually a pretty difficult size to jam. This one has footholds, so it’s a little more foregiving. From Mountain Project. There was a steep “re-learning” curve at first, but I picked it back up fairly quickly…better than expected, and I could tell my improved technique and fitness from 7 years of sport climbing would be a great asset on these trad climbs as well. A big part of this process was re-learning to trust the gear, and nothing works better for that than practice falls. After just about every climb, after I clipped the chains, I would un-clip and down climb a few moves and take practice falls onto my gear. This reinforced my confidence in the gear, and helped increase my willingness to go for it on each successive climb. I joked to Janelle that I probably took more falls on sandstone that day than in my entire life up until that point! The strategy worked, and I got a lot of great rehearsal, and gradually built my confidence. Throughout the day I climbed all the sizes with no falls, and even managed onsights of a couple 5.12 finger cracks. I was regaining my confidence, and was really psyched for more! S-Crack – a nice wide crack that I could practice my off-width technique on…got my knees some work on this one! From Mountain Project. After a mountain biking “rest day”, we ventured out to the “Zappa” Wall in Escalante to try something harder. My buddy Piz had established some 5.13’s out there, and I was curious to try. The goal for the day was a 5.13- called Blood Pulse. It receives sun first thing in the morning, so we planned a pre-dawn departure from the city, and raced out to the wall. The boys crushed the difficult approach up the talus slope, and we were all in good spirits when we reached the wall at about 8:00 – just as sun hit. I warmed up with two laps on the neighbooring route (Hanging to the Right), a nice hand and finger crack. I was able to torque my fingers in the crack and build up my pain tolerance for what I was expecting. I was setting up to go for the onsight on what would be my hardest crack onsight. I have onsighted dozens of 5.13 sport routes, but this was different. I would have to place my own gear – in this case, very small cams – the least reliable, especially in sandstone. Many of the placements also appeared to be “blind”, in that I wouldn’t be able to look directly into the crack and verify the quality of the placement. As a result, I would have to trust my skills and trust the gear. That’s why the previous day’s practice was so critical. It reminded me that the gear works, and it can be trusted. It loosened me up (a little) to focus on the moves and climbing my best, rather than the consequences of a fall. Blood Pulse (5.13-) – a really technical crack that climbs like a face route, but requires tiny cams to protect. It has a powerful start, then remains sustained to the end! Photo by Rob Pizem, from Mountain Project. I studied the route from the ground and devised a sequence through the starting boulder problem, which appeared to be the crux. I racked my tiniest cams at the front of my gear loops, ready to fire into the crack, started my deep-breathing, and set off. The opening moves involved crimping the edges of the finger-tip wide crack, which suited me very well, while doing lie-back-esque moves and smearing on bad foot holds. For a crack, the moves were quite technical as well, with interesting body positions that force you to either side of the crack. I had to really bear down on the opening moves, and eventually reached a decent foothold that allowed me to fire in two tiny cams. Breathe…breathe…”the gear is good”…breathe. I continued through some tight, painful finger locks, pasting my feet on bad slopey edges, then encountered a tricky switch beetween cracks. I placed a good #1 (blue) tcu, and went for the other crack out left, did a couple long moves, and reached the wide pod 3/4 the way up the route. It had a small left foothold that was pretty good, and a bad, slopey high right foot that allowed me to barely rest if I gastoned the edge of the crack. It provided a tenuous rest, but I was thankful for it. I was very gingerly balanced on these holds, and if I made no sudden movements, I could hang here briefly. My concern was that the right foot would pop, and I would sail off. Every few moments I would readjust it to make sure it didn’t slip. I needed to place gear — all I had below me were three tiny TCU’s, and a ground fall was possible, so I reached for the #4 camalot I had brought for just this spot, and carefully placed it, trying not to lose my balance. I was psyched to discover that it fit in the pod, but it was a shallow placement, and I would have to be careful not to bump it when I climbed past (or it might fall out – a potential disaster!) I rested as much as I could, but soon sensed my left foot was tiring, so I continued on. Only a couple body lengths to the end of the pitch…. I used some tricky foot technique with some heel-toe cams to get past the wide pod, careful not to bump the #4 Camalot. I soon reached a nice 3/4″ (purple 0.5 camalot) crack that was better than I expected. Still, I was thankful for the ring-lock practice I had done on the previous day! I made a couple moves to a nice hand jam, level with the anchors, clipped the chains and let out a “WHOOP!” I was back! I had just made my hardest trad/crack onsight, and it was a proud one. I had to work out complex beta on the fly, I had to place tricky gear and trust it, I had to manage a pump, and stay relaxed throughout the climb, and I pulled it off. I was proud of my preparation for the route — I had been patient and built up to it gradually, as we discuss during the Performance Section in the RCTM. I had allowed myself to get to know the crag and the style of climbing it requires, and I gave myself room to learn and build confidence and momentum on easier routes, before stepping up to the goal climb. Too often we rush into the harder grades, fueled by ego and peer pressure, when the best course of action is to be humble, check your ego, and allow yourself to learn in the best environment (easier routes). I was also happy with my performance in the moment. I busted out hard moves when needed, and when possible, I lowered my intensity to conserve energy for the rest of the route. I’m still not quite up to the level of “Sandstone Samurai”, but I had made great progress in regaining my previous form, and I was ready for something bigger…. On our way out, I took a victory lap on “The Curve”, a really nice 5.10+ splitter that happened to be in the shade. It had some nice finger locking that led to perfect hands. It was the icing on the cake of a great day! The Curve – a really nice 5.10+ that starts with fingers and transitions through all the sizes up to wide hands. From Mountain Project. On the way out, I scoped out Rob’s mega-testpiece, a striking 5.13+ roof named “Frank Zappa Appreciation Society” (for a club he started in high school). It would have to wait for another trip, but that itch I started with has only grown worse, and I know I’ll be back out for it as soon as conditions permit. For now, I was happy with my progress and ready to apply myself to my old stomping grounds of Zion Canyon. Frank Zappa Appreciation Society (aka The Cobra) 5.13+ – Rob Pizem’s Coup de Grace – I can’t wait to try this! I had a route waiting there for the past eight years that had been haunting my dreams, and I was eager to return and vanquish it. Was I up to the task? Stay tuned next week for the exciting conclusion…. A captivating splitter in Zion Canyon that has haunted my dreams for eight years. Will it go free??? awesome trip report, glad you had a good weekend out there. what were all of the 6 routes you did the first day? barney, s-crack, rednekk, pashion for pumping, the one around to the left that has sort of overhang to RF corner with thumbstacks, and maybe the finger corner left of 4-wheel low? Thanks again for the beta!